Now that I’m back with a different type of visa, I had to go re-register myself with the authorities. 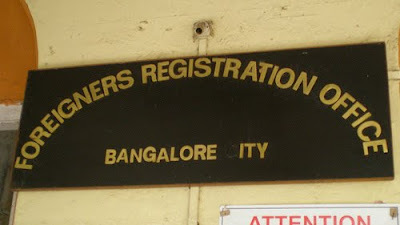 About a year and a half ago, I wrote about what it was like to visit the Foreigner’s Registration Office. I described it as Kafkaesque… the office was in a decaying room at the Police Commissioner’s Office; there were no signs, no queues, no one to tell you where to go, piles of files and papers everywhere, and no computers in sight. Since my last visit, many things have changed at the FRO. First of all, the name. 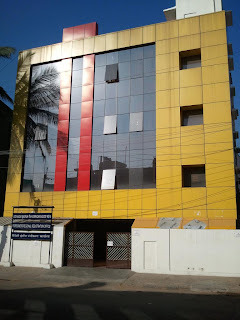 It has gained an extra R and become the Foreigner’s Regional Registration Office. This means the good old FRO has climbed up an extra rung in the Indian administrative machine and gained new powers. Files no longer have to be sent to New Delhi. Everything is processed sur place, which means the process should be quicker. Many other things have also changed. I first went to pick up the application form and list of documents to submit. I went over it carefully with the bespectacled-and-moustached bureaucrat behind the window. I had lots of questions for him. How many photocopies are needed? And how many photographs? Does the liability form need to be notarised? Do the photographs have to be glued or stapled? He answered all my questions patiently and with a smile. “Only one-one copy. Two photos only. Notary is not necessary. No gluing or stapling, Madam.” I was taken aback. Only one copy of each document? 2 photos, not 6? No notary needed? It sounded too good to be true. I returned a few days later armed with all the required documents but also extra photocopies, some spare passport-sized photos, other documents that were not on ‘the list’ but may suddenly be required, and a glue stick! I knew I would be spending most of the day there so I also brought plenty of reading material and a lot of patience. I was given a number: 33. The electronic number system was a new addition. 30 minutes later, my papers were being scrutinised by the first official. He leafed through my papers while I watched, fingers crossed. Would a document be missing? Would he ask for something not on ‘the list’? I held my breath as he examined my documents and checked them off the checklist. I passed! He told me to go to the next person, a man sitting behind a computer. This is another big change: the huge piles of files have been replaced with computers! The piles of files at the old office. Official number two gave me the green light and directed me to the first floor. A blast of air-conditioning hit me as I opened the glass door. This is another welcome change to the new-and-improved FRRO experience. Here the number system was operating again. As I waited, I had a good look around. An employee was directing people where to go. There was a long counter with glass windows, each clearly numbered. “Eatables are not allowed”, warned a sign on the wall. Next to it was a map of the world. Behind each window was a computer. There were many new faces. An office peon had the job of shuttling files up and down between floors. When my number was called out by the electronic voice: “Token number three three”, I took my pile of papers to the counter. They were once again examined by two more officials, who scribbled details on a paper. Finally I was directed to the row of windows where I handed in my file. I was then asked to sit and wait. I spent the rest of the day sitting and waiting. When I inquired about the progress of my file, I was told that it was still with “the higher authorities”. “Take your lunch and come,” the friendly official suggested. The FRRO’s upgrade in status and facilities reflects India’s developing immigration policy. More and more people are coming to India to take advantage of the country’s growth and invest in business opportunities. In the past year there have been many changes implemented across all visa categories. As in every country, these policy changes reflect not only economic realities but also security concerns. Bangalore’s FRRO has received a huge boost in human and financial resources. The improvements in the services and facilities they now offer are welcome. I hope Venkatesh is still there. 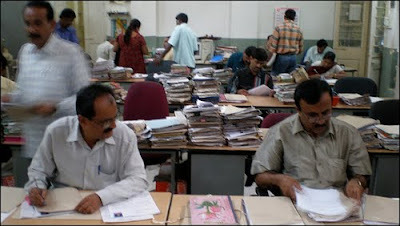 In the old FRO, Venkatesh used to do all the job while the others would stay idle, waiting for the lunch break. Hi Isabel welcome back! I missed your posts! And, I'm keeping my fingers crossed for your application at the FRRO!Hope everything goes smoothly! May Kafka's ghosts leave you alone and Godspeed your application! Gosh!what took them so long to get out of that dungeon?..and to install a computer..?